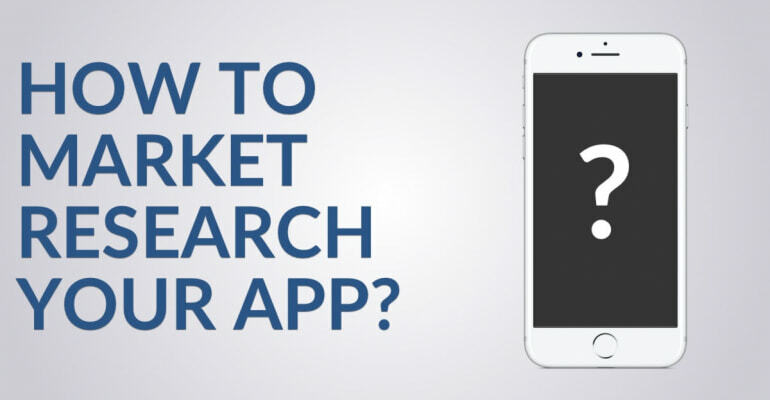 Market research is crucial for the success of your app. Based on the market research you do, you can make better decisions about design, development, marketing and your app’s business. Traditionally, market research has often been done by giving surveys to focus groups. Based on those surveys, marketers then made decisions about the products they were trying to sell. Surveys are fraught with selection bias, so you never know what you’re really testing. Do they just like the product or will they buy it? This is where business validation comes into play. In this article, we’re going to take a different approach to market research. Instead of creating new data with surveys, we’re going to find the data that already exists. When you’re building your app, you are really choosing from dozens of app projects you could potentially build. Many app ideas haven’t been discovered yet, even though most people claim the opposite is true. Great apps solve a problem, so unless you’re out of problems, not all apps have been built yet. You always build your app for a specific audience, and that means you can solve the same problem for different audiences. When you start with many app ideas, you need to go through a process of elimination. This is where Kill Your Darlings comes in. Instead of looking for one great app idea, you start your market research with 10 decent app ideas and find out which one is the best. You kill the others. The next thing I did is the most important in market research of your app ideas. Instead of looking for proof that one of these ideas was the best, I started looking for proof that every idea was the worst. I wanted to get rid of these ideas as quickly as possible! When I’m researching an idea, my first stop is always Google Trends. With it, you can see the relative popularity of searches in the Google Search engine. It’s a great market research tool! Spotting disease epidemics – when are people Googling for flu symptoms? Quick Note: You won’t find how many people Googled a search term in Trends. Instead, it shows what percentage of people searched for a term relative to when this search term was the most popular (i.e., from 0% to 100%). So, what do I do? I type in my search queries into Google Trends and measure their relative popularity (see image above). I chose to format the search term as “best X app”, because people Googling for such a phrase are clearly looking to download an app. When you’re unsure whether your search term reflects what you’re looking for, simply Google the term, and check if you expected the results that you get. I chose a wide time range for the graph (2008 to 2017), so I can clearly see the popularity over time. The popularity of apps in the App Store is fickle, so I wanted to see the full range since the dawn of the App Store in 2008. It’s easy to make a mistake interpreting this graph! When working with trends, it’s important to consider the trend directions instead of shallow data points. Should I choose the planner app idea because it’s more popular than the journaling app idea? I wouldn’t pick the to-do list app idea, because it’s declining after it rose to popularity. It’s a sinking ship! I also won’t pick the quotes app, among other reasons, because it’s appearing to flatten out. I can’t say for sure, it might be temporary, but I don’t want to bet on it. I might choose the planner app idea, because it has a pattern: in January and in August, planners are more popular. Why? I’d have to research a hypothesis here, but an uneducated guess is: people buy planners in January and August! I could tap into that trend by giving them an alternative purchase: my app. It’s also a good idea to check what you see in the graph with what you know about that particular period. Don’t just use numbers in your market research! For instance, Wunderlist was created in 2011, in the period to-do apps were popular. The first version of Bear was published in 2016, which coincides with the rise of journaling apps. Keep in mind that this doesn’t prove that the graph is right, it’s just data to support assertions you make about the trends. What about the journaling app idea? As you’ll discover in future articles about the work I did for the Crest app, I chose to combine a planner app with a journaling app, for a specific niche market. The assertion I made based on the Google Trends graph, is that “journaling” is a category that grows. 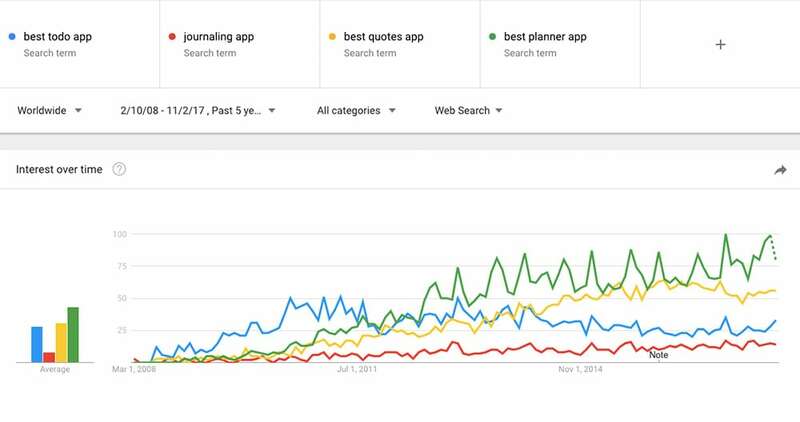 Combine that growth with the purchase trends seen in planner apps, and you have a (theoretical) winner app idea. And the other ideas? I killed them… Let’s move on to the next step! 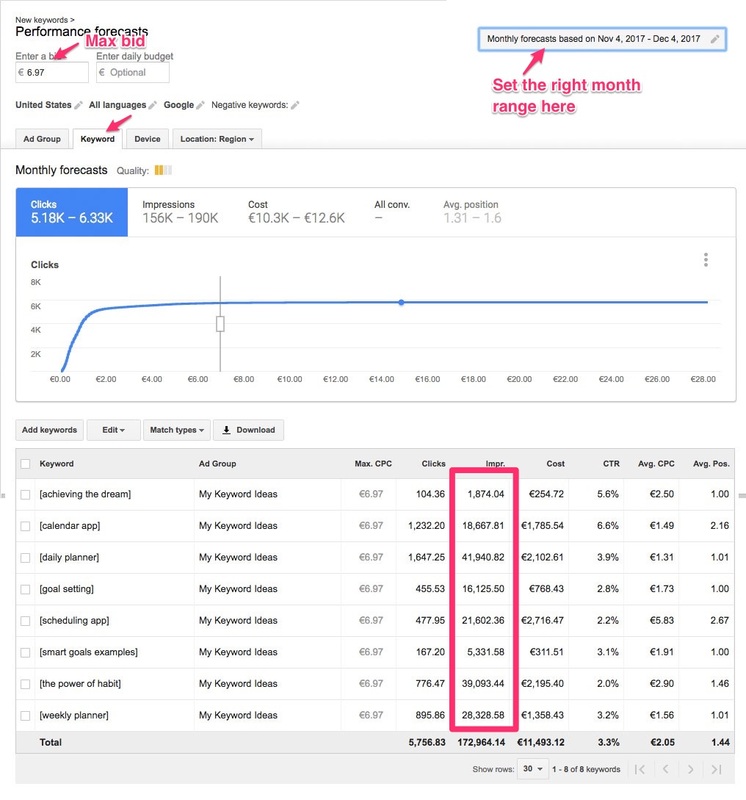 Yes, the next market research step involves another Google tool: Google Keyword Planner. With this tool, you can find fine-grained volume data for search phrases. How many people Googled a specific search query? It’s typically used for search engine advertising and Search Engine Optimization (SEO), but as a research tool it’s just as valuable. A great thing about Keyword Planner is that you don’t have to come up with ideas for search phrases yourself. It can make suggestions for search phrases based on some input you give it. The people who search for information related to journaling and to-do list apps, what specific search phrases do they use? When they search for those things, what do they find? How many of them search for these phrases? When you’ve done your research with Keyword Planner, you end up with a list of search phrases and their average search volume. You can use this for SEO, for App Store Optimization, and as a list of topics for blog articles you can write. Remember how we wanted to look for research data that already exists? The search phrases you find with Keyword Planner are the words your customers use to (potentially) search for and find your app. Let’s break that down. Say you’re a potential customer for the Crest app. You have a problem: you’re having trouble to achieve your goal, starting a business, because you don’t have a plan. Your days aren’t structured, so you struggle to get where you want to go. This is a problem. It’s the problem the Crest app solves. What would people with that problem search for on Google? The “seed” search phrases I put in are pretty good. One of them has zero hits, so I’ll have to refine it. Always keep in mind what the intention is of someone when they type a search into Google. Are they looking to make a purchase? Discovering options? Looking for alternatives? Or just browsing? The keywords Google came up with are pure gold. These are the words you’re looking for. 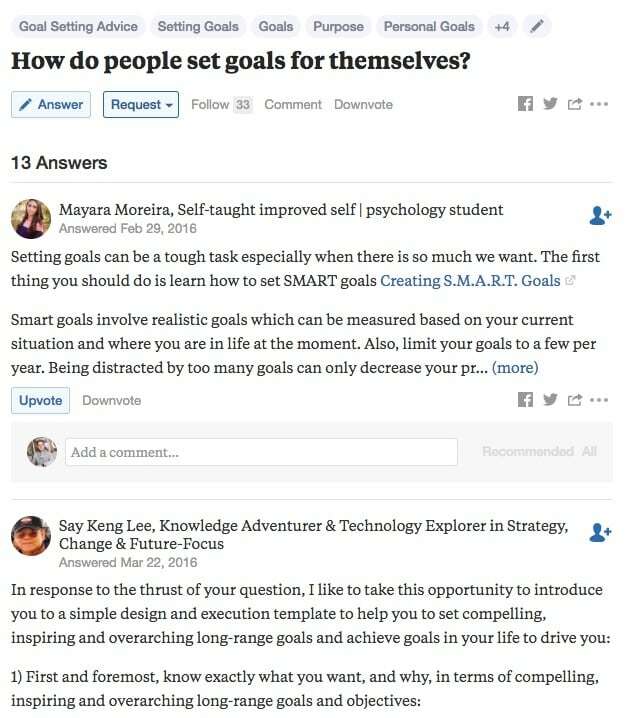 Phrases like “goal setting”, “the power of habit” and “weekly planner” are all words I couldn’t come up with on my own, but now I know people search for them! Unfortunately, Google only gives you ranges to work with. This isn’t absolute search volume. Instead, Google is just giving you ballpark figures for you to work with. Fortunately, there’s a trick where you can get to actual search volume. Quick Note: If you want to tap into these searches, write a blog post on your website that includes 1-2 keywords (or keyword clusters) that you find in Google Keyword Planner. It’s a bit more involved than that, but this is the core of Search Engine Optimization (SEO). Next, I want to get more accurate search volume data. These ranges are OK, but I want to know exactly how many people search for these terms. This also helps you to compare search phrase volume for different app ideas. First, in the keyword ideas overview as shown in the image above, click the blue arrow for a few keywords. The arrow is in the last column that says Add to Plan. 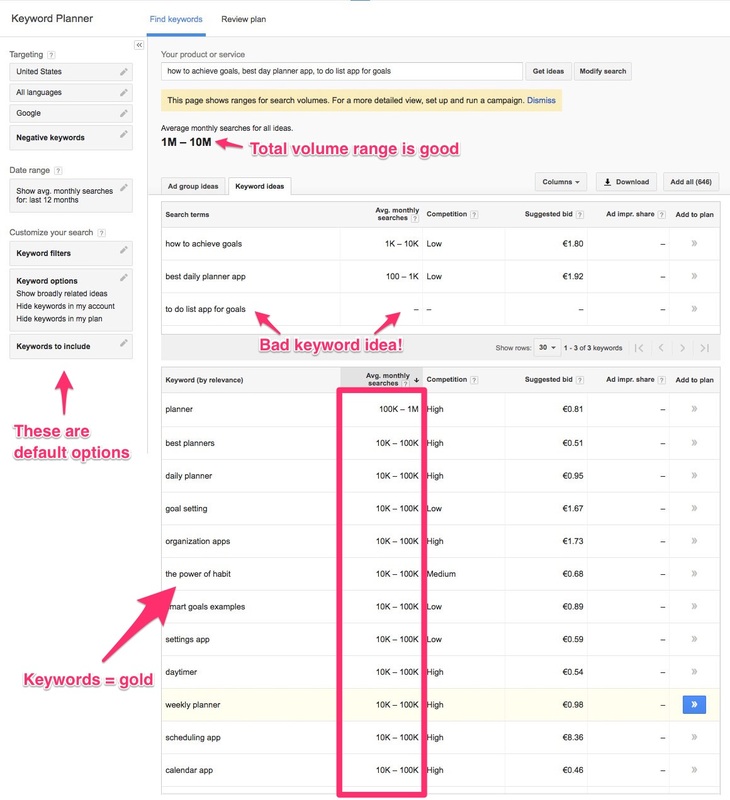 This will add these keywords to your keyword plan. Then, click Review Plan. This will take you to a new page. It’ll show a graph and spreadsheet. Make sure to go to the Keyword tab. Also, make sure to choose a period of a month in the top-right Monthly forecasts based on …. Then, choose Match Type -> All -> Exact Match from the menu. Finally, at the top of the page, set $1 or €1 for Enter a bid and press Enter. Quick Note: You can also set the maximum bid here, i.e. choose a bid based on the line graph. This means you’re only seeing impression data for the first search results page. The spreadsheet should now update, showing you more accurate clicks and impressions data compared to the ranges you got before. Make no mistake – the dollar values you see are advertisement costs based on those search phrases. The impression data is real though! This is the number of times Google thinks your ad (or search result) will be seen in the given period (hence “Impressions”). So what do you do with this data? You can use it to rank app ideas based on popularity. A popular search phrase doesn’t necessarily mean it’s a good app idea, but it gives you a rough estimate of the demand for your app. Awesome! Let’s move on to the most important research step! Don’t scope out the market in numbers from your Ivory Tower. It’s time to now move away from the cold research tool, and get into stories, problems and questions. Empathy is the most valuable market research tool. Thanks to Google Trends and Keyword Planner you now know where to look. That doesn’t mean you have a winner app idea yet! You’ve eliminated some ideas, but the real litmus test comes when you present your app to someone that has the problem that your app solves. We’ll get to idea validation in the future. I Googled the phrases, which gave me a ton of research on competitors, blog posts, alternative products, etc. I used these phrases on social networks and discussion boards like Quora, Twitter, Facebook, Reddit, Hacker News, LinkedIn, Product Hunt, etc. By trying to put myself in the shoes of the people I seek to serve with my app idea, I learned a lot – more than I ever could from staring at numbers. That’s all there is to it! Got questions or comments? Let me know below! In a future post in this series, I’ll show you how I did competitor research and how I got my app idea in front of potential customers. It’s going to be interesting!